Bryan Tool & Machining is here to offer advice and help you to explore your options regarding equipment refurbishing and replacement. Real world experience from working in the machining business has given us a valuable perspective to share with you. Combined with our relationships with leading controls and equipment manufacturers we are in able to assist you through the entire process. The decision to upgrade your existing equipment or purchase new is an important one that requires a significant investment. We are committed to giving you the information you need to make an educated decision that will benefit your business for years to come. If you would like to talk with us about your plans for upgrading or replacing equipment in your company give us a call we're here to help. 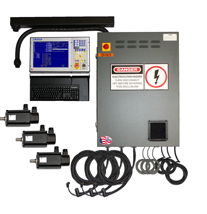 Industrial CNC controls with user friendly interface for quick and efficient part production. "The quality and workmanship of the CENTROID equipment was outstanding and very professional. CENTROID was able to custom tailor the control to allow us to continue to use our rotary milling arrangement as before and even expanded our capability. The short story is that we ended up with a four axis CNC mill for less than half the cost of the three axis Haas. This includes the work that was done by our staff." - Vic Brown President, American Machine Works Inc.
CNC control kits for OEM and Retrofit. CENTROID CNC controls ship from the factory completely assembled and tested ready to install on your particular machine tool. All the operator control buttons, the PLC ladder, motor wiring, even all the cables for Spindle, Coolant, Lube, and any other accessories are prewired, programmed, tested and ready to go. Designed for both new machinery and the Retrofit upgrade of existing NC/CNC machines. We have over 5000 servo CNC controls in operation worldwide. No one else has more experience retrofitting classic machine tools like: Bridgeport , Mori Seiki, Hardinge, Shizuoka, Prototrak to name a few. We STOCK common control configurations for immediate delivery! Automation solutions from Mitsubishi Electric can help your business create and deliver products in ways that are more efficient, cost-effective, sustainable and safe. Bryan Tool & Machining is an authorized sales and service dealer for ATRUMP. 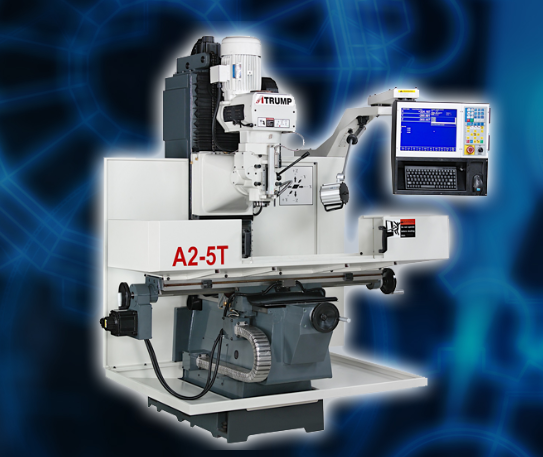 ATRUMP manufactures machining equipment for use throughout our industry. We are here to help educate and assist you in making the best decision on a new piece of equipment for your company. Our relationship with ATRUMP as an authorized dealer enables us to be there at each step from sales to training after the sale. As well as service when needed. If your interested in learning more about ATRUMP and if their machines are right for you please give us a call and a member of our management team will be glad to talk with you. A Trump Machinery, Inc., incorporated in 1989. Provides the CNC and conventional machine tool industry with a complete line of Milling Machines (Knee & Bed); Precision Lathes; Universal and MONASET Tools and Cutter Grinders; CNC Mills (Knee, Bed and Machining Centers) and CNC Lathes. A Trump is the U.S. distributor for EXTRON -- one of the top manufacturers of both CNC and manual bench lathes, precision engine lathes, knee mills and bed-type mills in Taiwan. Extron has been in business for over 35 years and sells approximately 20,000 machines worldwide.